I like the idea of taking time to reflect on a regular basis—and not just at the end of a year. Maybe next time, I’ll do about post about what I’d like to learn in June so that I can compare my goals to my experiences. 1. If Mockingbirds can sing in the darkest hours, so can I.
I’d love to sit down and have a conversation with Harper Lee about mockingbirds. 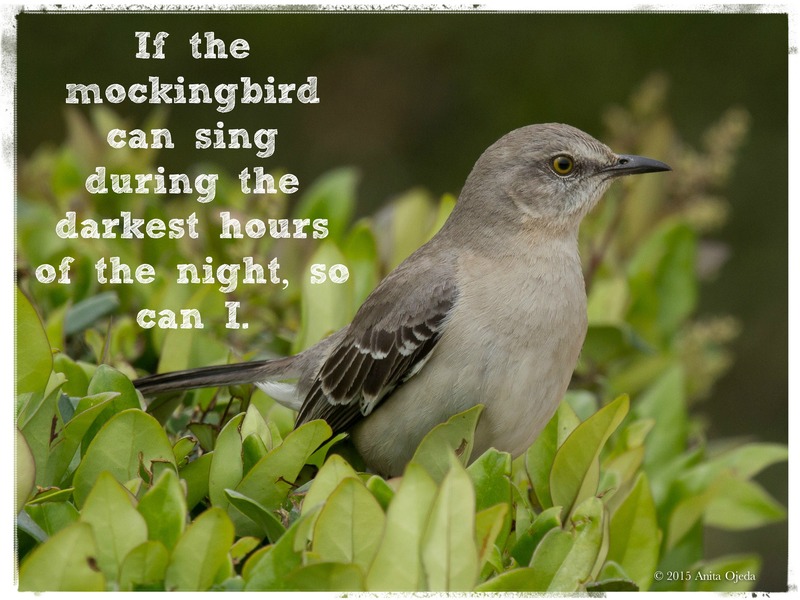 For the past three weeks, a mockingbird has spent the long, dark lonely hours between midnight and five am singing his heart out near my bedroom window. At two this morning, I woke up to give Pedro his pain medications. This involves turning on lights, helping him stand and finding him food to eat along with his meds. Thankfully, he just has to suffer through 24 more hours of his clavicle bones grating against each other and sending sharp jabs of pain throughout his body with every movement. I confess that the mockingbird has annoyed me. Yes, it’s an innocent bird and all it does is sing. But it seemed to exacerbate an already bad situation. I had thoroughly woken up and I felt like I would never fall back asleep. But since Harper Lee said you shouldn’t kill a mockingbird (as much as I love birds, the thought did flit through my mind), I started to wonder WHY the mockingbird sings—and why it sings during the darkest hours. You see, this year has pushed us around quite a bit, and just when things started to look better, Pedro crashed on his mountain bike and broke his right clavicle and his left wrist. And here’s where I confess to being secretly whiney about the situation. I have no reason to feel whiney—I live a comfortable life in a wonderful country and I have all of the material comforts that I need. I had plans, you see. I had planned a mini-birding trip for Monday. I wanted to see the rare Tufted Flycatcher pair who decided to venture much further north than their regular habitat and build a nest in southern Arizona (don’t judge—I like birds). Next week, we had plans to travel to California to help our daughter and son-in-law move to Oklahoma. After arriving in Oklahoma and house hunting with ‘the kids,’ Laura and I had plans to travel to Mansfield, MO to visit Laura Ingalls Wilder’s home (and look for new birds, of course). But back to the mockingbird. Maybe it sings because it’s cold and sitting on the nest is hard work. Maybe the male sings to encourage its mate who incubates the eggs. Maybe it sings because the silence seems big and the darkness heavy, and the cheery notes of praise pierce the silence and lighten the darkness. And if the mockingbird can sing in the darkest hours, so can I. So I started singing the first song that popped into my mind—“Praise God, from whom all blessings flow,” (silently, of course, because I didn’t want to wake Pedro up). And I fell back to sleep before the mockingbird did. 2. I can rise to the occasion and enjoy life on the wild side. Ok, for me, the ‘wild side’ is anything out of my comfort zone—and anything out of my comfort zone usually involves relationships with people. 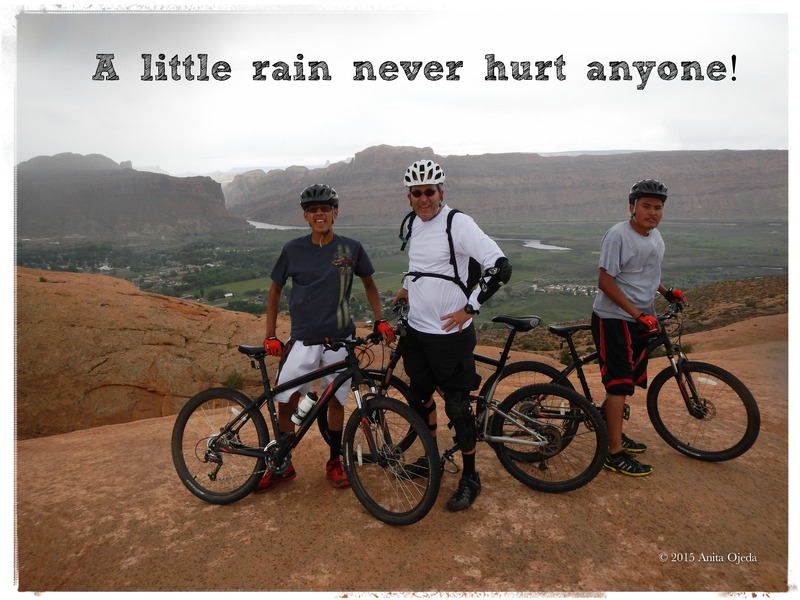 Over Memorial Day, Pedro and I took two of our students camping and mountain biking in Moab, UT. We had a wonderful weekend and both of the young men enjoyed the trip. We didn’t have a lot of deep conversations (but they did talk a little about their lives and families around the campfire the second night), because both of the boys are pretty quiet. 3. Boys eat about four times more than you would expect. I took copious amounts of food, but our coolers were almost empty by the time we got home. The two gallons of milk I thought would be sufficient for four people for three days? Nope. If you don’t have a teenage boy of your own, and you plan on hosting one, make sure you have lots and lots and lots and lots of food! 4. I am not alone. I read an inspirational story by Jenni DeWitt that reminded me that so many other people out there have shared experiences—we just need to connect and tell our stories and learn to come alongside each other. If you’re interested in Jenni’s story, or if you’d like to sponsor her in the awareness and fund-raising walk she’s participating in on June 5, click here. 5. I actually like podcasts. I’m not much of a listen-to-anything-but-silence sort of person (with the exception of the wind in the trees and birdsongs, of course). But I’ve discovered that a gal can learn a lot about writing, blogging, creativity and platform building by listening to podcasts. My favorite free podcasts are a series by Kirsten Oliphant called Create If Writing. The podcasts are under an hour long, and perfect for something to occupy my mind whilst I exercise (maybe there’s a whole blog post there about how Kirsten Oliphant and Michael Hyatt helped me lose ten pounds…). My favorite subscription podcasts are produced by Michael Hyatt for his Platform University. I don’t know how long I can afford to subscribe, but I’m learning a lot of useful things about life and platform and blogging and using my creativity for God’s purpose. 6. Even with safety equipment, calculated risks might result in injury. But without them, the injuries would be a lot worse. Pedro had on a helmet, knee and shin guards and elbow pads (and an iPhone 6 in his pocket), but he still sustained a fractures left wrist, a shattered right clavicle and a bunch of bruises. What he didn’t get was a broken elbow (thanks to the elbow guard or a broken leg (thanks to the iPhone). He’s scheduled for surgery tomorrow. Emily Freeman at Chatting at the Sky has a link-up for bloggers to share their reflections on the lessons they’ve learned in the previous month. I’m also linking up with Jennifer Dukes Lee at #TellHisStory–another source of wonderful reads to inspire you and Words with Winter. What about you? What have you discovered or learned in the month of May?